ANNAPOLIS, Md. 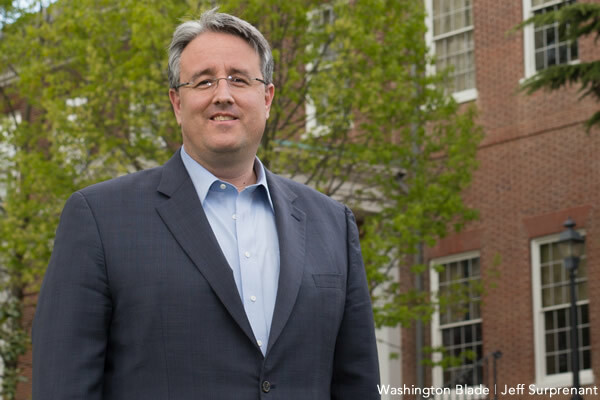 – A bill that would ban discrimination against transgender Marylanders on Thursday received final approval in the Maryland House of Delegates. State Del. Michael McDermott (R-Wicomico and Worcester Counties) described trans Marylanders as “confused” as he spoke against SB 212. “We are a confused state, voting for a confused bill,” said the Eastern Shore Republican. State Del. Anthony O’Donnell (R-St. Mary’s and Calvert Counties) introduced a proposed amendment to SB 212 that sought to ban anyone from asserting their gender identity and expression to “enter a place of public accommodation for the purpose of committing an illegal activity.” House Minority Whip Kathy Szeliga (R-Baltimore and Harford Counties) put forth a proposal that would have exempted bathrooms from the measure. Lawmakers defeated both proposed amendments. State Del. Gail Bates (R-Howard County) and McDermott introduced proposed amendments that sought to exclude “distinctly private and personal” places and “private facilities” from SB 212’s public accommodation provision. Lawmakers rejected both proposals and others that sought to provide the public accommodation provision from the measure. State Del. Neil Parrott (R-Washington County) and O’Donnell on Wednesday unsuccessfully sought to delay the second reading on SB 212 by a day. Szeliga sought to remove the measure’s public accommodations provisions, but she withdrew her two proposed amendments. State Del. Kathy Afzali (R-Frederick County) recently said in a letter to her constituents that HB 1265 would “normalize abnormal behavior.” Parrott referred to the measure as the “bathroom bill” in a post to the website he runs under the banner “Do you want men going into the ladies room?” with a graphic that shows a man appearing to look at a woman in a restroom stall. State Del. Heather Mizeur (D-Montgomery County) noted she has “never been more disappointed” during her eight years in the House as she said she has been listening to the debate over SB 212. The vote caps off an eight year effort to add gender identity and expression to Maryland’s anti-discrimination act. The House in 2011 approved an anti-trans discrimination bill that did not contain protections in public accommodations. The Maryland Senate earlier this month passed a measure approved SB 212. The House Health and Government Operations Committee on Tuesday approved a nearly identical bill to SB 212 that state Del. Luke Clippinger (D-Baltimore City) introduced. Brown is among those who also applauded SB 212’s passage. “Nobody should ever be forced to endure this kind of discrimination or harassment, and that’s why we’re taking this important step to protect all Marylanders,” he said. Gansler, who submitted testimony in support of the measure, also praised lawmakers who supported it. Gov. Martin O’Malley is expected to sign SB 212 into law in the coming weeks. Observers expect Parrott and others who oppose the bill will try to prompt a referendum on it once the governor signs it. Thank you, Maryland Coalition for Trans Equality. I’m not sure what Dana Beyer or Gender Rights Maryland had to do with this. But if I find out they played a major role, I will thank them too. Julia, as a founding steering committee member of the Maryland Coalition for Trans Equality, this win is a culmination of over 15 years of efforts from folks too numerous to name. Gender Rights Maryland, while not a coalition member also worked to assure this bill’s passage. This has been a team lift. It’s a great day to celebrate all the long hard work from volunteers who collected nearly 16,000 postcards and made tens of thousands of calls in support of the Fairness for All Marylanders Act. We take this moment to rejoice in the Greatness which lifts us all up today. Tomorrow we go back to work to make sure the Governor’s signature effects the full and comprehensive enactment of this truly historic piece of legislation. A special thanks to Owen Smith, now working to further equality in another part of this wonderful country. Thanks Owen! Woo hoo! Way to go, Maryland, my Maryland! Thank you Rich Madaleno, Bonnie Cullison, Heather Mizeur, Jamie Raskin, Luke Clippinger, and many others! Way to go Maryland Number 18!